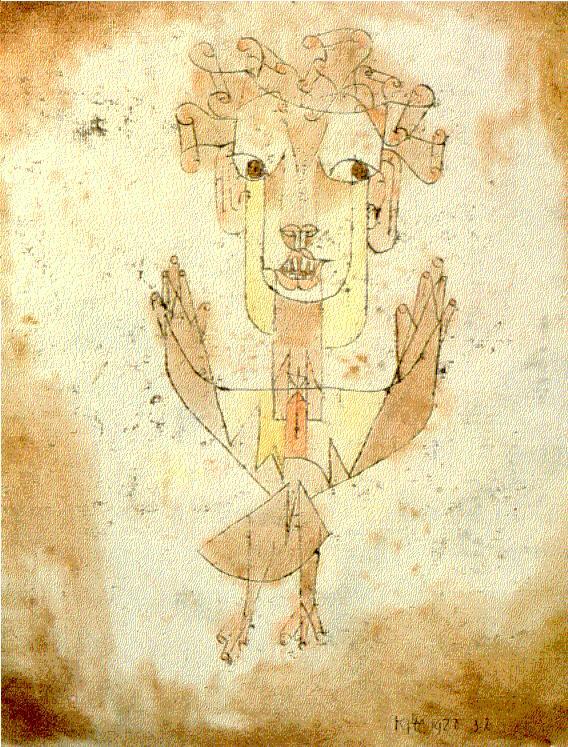 Interesting destiny for the watercolor, “Angelus Novus”, a critical early work by Swiss artist Paul Klee. The “Angelus” is also known as the “Angel of History.” Klee painted it in 1920. The Jewish mystical writer, Gerschom Scholem, bought it shortly thereafter and hung it in his apartment in Munich, Germany. Scholem’s close friend, the cultural philosopher Walter Benjamin, viewed it in a major exhibit of Klee’s work at the Galerie Goltz in Munich and acquired it without hesitation. Goltz brokered the sale between the two close friends. 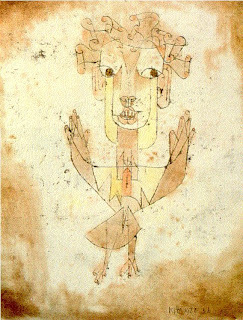 Benjamin’s relationship to the Angelus Novus was nothing short of profound and deeply rooted in his own existential angst about civilization, the absence of happiness in society, his vision of a humanity bereft of humanity, and yet, in Klee’s angel, he might have gleaned his own angel, a metaphysical creature on whose wings History could be carried aloft. Hope springs eternal, doesn’t it? Some have written that the Angel’s eyes bear witness to the horrors of history since the dawn of ages and into an unknown future. But they are compassionate and empathetic. For Benjamin, the “Angel” was his angel and Klee’s work took on proportions greater than life, overwhelming Benjamin’s psyche. It was as if this Angel was his redemption, his life buoy. In moments of despair, he would leave it in trust with his friends, including Scholem, and would pick it up again when passing through. Even when Benjamin was destitute to the point of not eating, he would hold back from selling his Angel of History. True, he tried several times. A year or so before his untimely death at Port Bou in the French Pyrenées, Benjamin considered selling the Angel to arts patron Ernest Morgenroth whose son, Ernest Gustav Morgenroth, he knew well—later he became known as Stephen Lackner, a well-known patron of the arts in the United States. Available sources are not clear about the last detail, which is how the Angelus fell back into the hands of Gerschom Scholem. But it did, thanks to Adorno. Was this “gift” specified in Benjamin’s will? Did Benjamin have a written will? 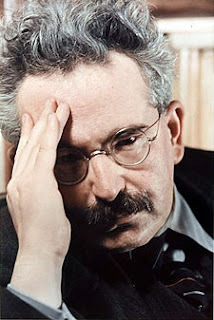 Safe to say, though, that Scholem, as first purchaser of the Angelus Novus, became again its owner, owing to the unfortunate premature demise of his best friend, Walter Benjamin. After Scholem’s death in 1982, the Angelus Novus was donated to the Israel Museum in 1987 by Scholem’s widow, Fania, with the help of the Herring Brothers, famed art dealers in New York, and Mr. and Mrs. Ronald Lauder. One fact is puzzling, though: when reading the information about “Angelus Novus” on the Israel Museum website, it indicates that Scholem “inherited” it. What kind of inheritance can this be between two very close friends whose trust in one another was sealed in part by an “Angel of History”? Sources: Kerber, Armin, “Lost Paradise: The Angel’s Gaze,” Zentrum Paul Klee, Bern, Switzerland, 2008; Theodor W. Adorno and Walter Benjamin, “The Complete Correspondence, 1928-1940,” Harvard University Press, 2001. 3/ “Noyers, plaine de Veneux-Madon,” by Alfred Sisley. 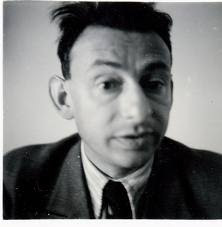 While in Paris during the German occupation of France, Mr. Krüger, a Berlin-based businessman and avid art collector, enjoyed his stays at the Hotel Saint-James & Albany. He paid 385,000 Francs for the three Impressionist works. Fate would have it that the Pissarro painting ends up at the Metropolitan Museum of Art, courtesy of a bequest in the name of an American scion and philanthropist, Douglas Dillon. 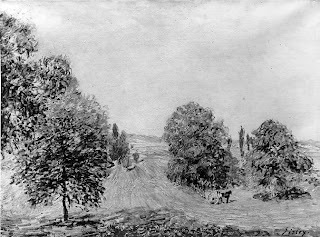 The odd thing about the provenance of the Pissarro is the name of the person who ostensibly owned it prior to Durand-Ruel, to whom that person had sold it in early 1941. Funny time to sell Impressionist works of art. But, let’s not think the worst of this work. The Met should be innocent until proven otherwise. The name of that previous owner is Braunthed, who lived in Neuilly sur Seine, a very wealthy suburb of Paris, home, in the 1930s, to some of the wealthiest members of the Jewish community and especially to German Jewish refugees who had settled there after Hitler had come to power in Germany. Until someone can clear up who “Braunthed” is, the mystery remains as to the circumstances under which “Braunthed” sold the Pissarro painting to Durand-Ruel eight months after the Nazis began to plunder Jewish collections in the Paris region. Moreover, no one has asked Durand-Ruel why it made it a habit of selling wonderful works of art to German industrialists, bankers, and aristocrats, during World War II. Perhaps, their client relationship dated back to the roaring twenties. Still, that's no excuse, is it? The two other works suffered a less glamorous fate, despite the fact that they were purchased from Durand-Ruel by the same individual, Wolfgang Krüger, at the same time. Allied troops "captured" or "liberated" the one by Renoir and the other by Sisley, after the fall of the Third Reich. Before being repatriated to France as of "unknown origin," they allegedly went through the Munich Central Collecting Point (MCCP). 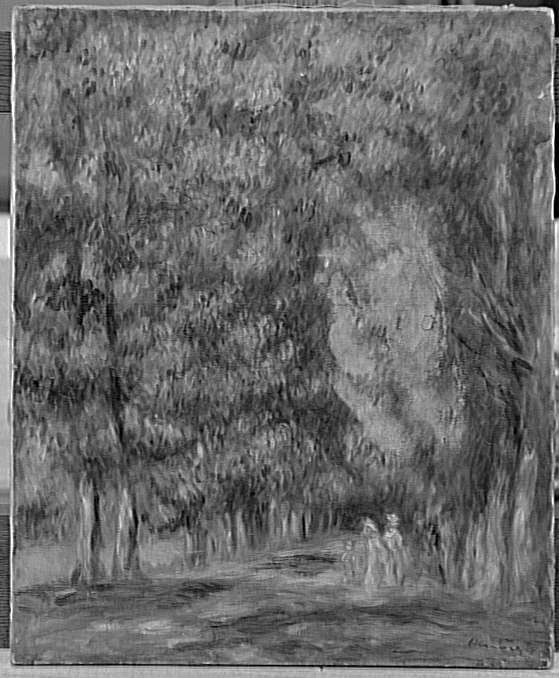 At least, the Renoir painting--Promenade, sous-bois-- did, according to the French Ministry of Culture. If so, there is no trace of it in the MCCP database produced by the Deutsches Historisches Museum (DHM) under the supervision of Angelika Enderlein. The so-called Munich number--7519--does not correspond to a painting by Renoir, but rather to a work by Panini. Back to square one. 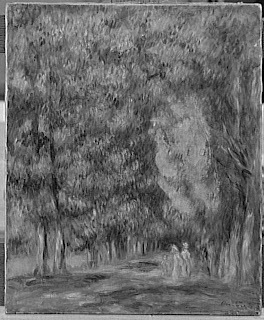 "Promenade, sous-bois" ended up at the Renoir House (Maison Renoir) in Cagnes-sur-Mer as MNR 207 where it keeps company to another ill-fated MNR painting by Renoir, “la Femme au puits”, also known as MNR 579, while the Sisley adorns the walls of a municipal museum in the birthplace of the "damned poet" Arthur Rimbaud, Charleville-Mézières. Why on earth did that small town receive the painting by Sisley? Political favor? Enriching local collections with stolen property? Who knows? In any event, the Sisley painting that once belonged to Mr. Krüger is now branded as MNR 209. Three paintings purchased from the same art dealership in Paris during Year Two (or Year 1.5, depending on how you count) of the Nazi occupation of France, ending up in two different nations, one ostensibly unfettered by the shackles of war while the two others remain in that purgatory called MNR. Why did the Pissarro not end up in the French Museum system as a MNR painting? 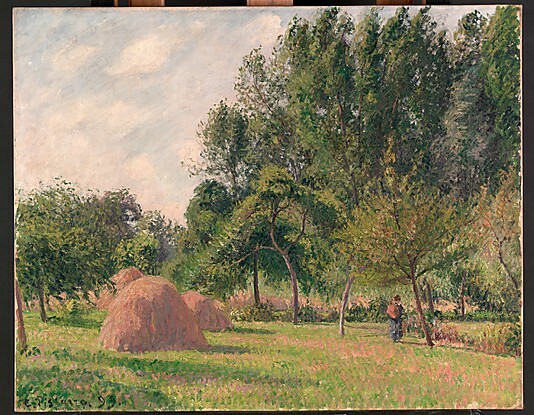 According to the Metropolitan Museum's website, the first post-1945 owner of the Pissarro was Robert F. Woolworth, who then consigned the painting to the now-defunct Knoedler Gallery in New York. Where did Mr. Woolworth obtain the Pissarro? From Mr. Wolfgang Krüger? or from yet someone else? What made the Renoir and Sisley works fit that category despite the fact that they shared a common wartime fate? If anything, the Pissarro is far more suspect than the Renoir and the Sisley.